Ever wonder about any of ENBseries' more esoteric effects, like image-based lighting and subsurface scattering? If so, you might enjoy my ongoing video series providing clear demonstrations of ENB's visual effects for The Elder Scrolls V: Skyrim. Videos 1 through 7 are included here, and you can also find me on YouTube. 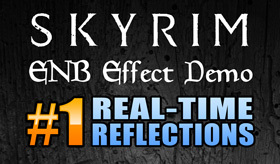 This video demonstrates the real-time screen-space reflections effect of ENB series for Skyrim, calculating true reflections in real-time as opposed to the standard simulated cube-map techniques. 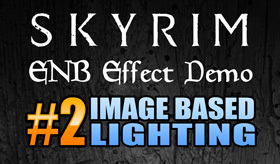 This video demonstrates the image-based lighting (IBL) effect of ENB series for Skyrim, an effect that is only now beginning to appear in commercial video games. IBL is an effect where the scene is illuminated from above by the light from the sky. To oversimplify: a image of the sky is reflected onto the scene. IBL also has potenial applications for interior scenes, but the Skyrim ENB only uses this effect in exterior scenes with the sky. In ENB series for Skyrim, subsurface scattering is mostly used to help skin to look more like skin, rather than like leather or rubber. This video demonstrates the screen-space indirect lighting (SSIL) effect of ENB series for Skyrim, an effect rarely used in ANY commercial video games to date. SSIL is an effect where light cast onto one surface is reflected onto other nearby surfaces. It can be considered a 'sister effect' to screen-space ambient occlusion (SSAO), working with light rather than shadow. This video demonstrates the screen-space ambient occlusion (SSAO) effect of ENB series for Skyrim. Ambient occlusion is an effect that calculates how exposed each point in a scene is to ambient lighting; areas with less light exposure, like corners & crevices,are darkened accordingly. ENB's implementation of SSAO is more sophisticated than most found in commercial games today; it respects lighting and transparency, and applies realistic darkening to affected areas rather than overlaying 'black blobs' as bound in some games. (*cough* ... Far Cry 4 ... *cough*). SSAO can be considered a 'sister effect' to screen-space indirect lighting (SSIL). 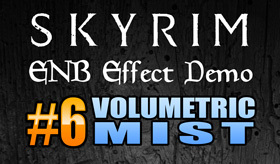 This video demonstrates the volumetric mist effect of ENB series for Skyrim. ENB for Skyrim allows for volumetric mist to be added to areas of the game world. The appearance of mist depends on weather conditions and requires an ENB preset designed to use the effect, such as Enhanced Shaders NLA. Volumetric mist helps foggy days feel more atmospheric, and also helps to mask lower quality distant textures and models with a realistic effect. This video demonstrates how the individual effects of ENB contribute to overall image quality. First a comparison is shown between vanilla Skyrim & full ENB, then individual effects are shown being added in sequence. Awesome showcases. I wonder if you're going to make a demonstration of skylighting next? Oh! Thank you so much for this!